Bill Wyman's Rhythm Kings are a Blues-rock band founded and led by former Rolling Stones's bass guitarist Bill Wyman, together with his lifelong musical partner Terry Taylor. The "Dirty Boys" duo produce, arrange and compose original material for the award winning band. The Rhythm Kings are renowned for their popular live performances as they frequently tour through Europe and the United Kingdom. The group has conducted only one tour in the United States, during the middle of 2001. The touring unit often is compared to the Ringo Starr All-Starr Band for its somewhat revolving door of membership as established musicians move from project to project. Bill Wyman e os "Rhytm Kings", são uma banda blues-rock, fundada e liderada pelo antigo baixista dos "Rolling Stones" Bill Wyman, juntamente com seu amigo de longa data Terry Taylor. A dupla "Dirty Boys" compôs, produziu e arranjou o material original daquela premiada banda. Os "Rhythm Kings" são reconhecidos pelas populares performances ao vivo e fazem frequentes tours através da Europa e Reino Unido. O grupo fez em 2001 a sua única apresentação nos Estados Unidos. Essas tours com performances ao vivo, são frequentemente comparadas as do "Ringo Starr all Starr Band" por reunir vários músicos da maior qualidade e já estabelecidos no meio musical. Rolling Stones: Bill Wyman, Brian Jones, Keith Richards, Mick Jagger, and Charlie Watts, October 1969. 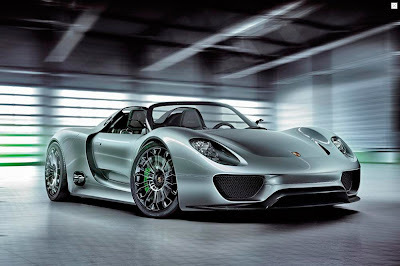 Next Porsche Supercar-The Hybrid 918 Spyder. Faster than a Carrera GT yet more economical than a microcar, Porsche next supercar is super indeed. Officially it’s only a concept, but there’s no doubt that project XG10 -- or the 918 Spyder concept -- will pave the way for the next Porsche supercar. 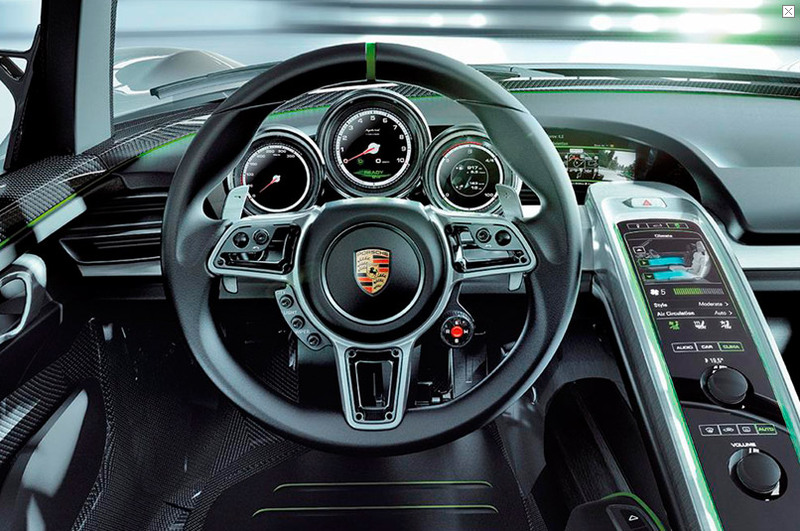 And what a supercar it is going to be: in addition to the normally aspirated, high-revving, 3.4-liter V-8 good for more than 495 hp, the striking 918 Spyder has three electric motors onboard that add another 215 hp to the tally. 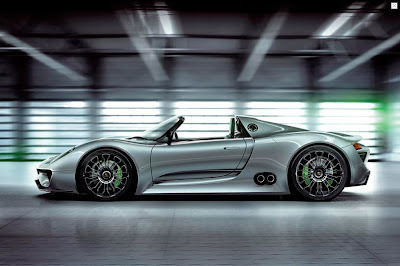 Says Wolfgang Dürheimer, board member in charge of R&D: “This car can lap the Nürburgring faster than the Carrera GT. At the same time, it averages 78 mpg [on the EU driving cycle] when driven gently. Are we going to build it? We will definitely bring some blank sales contracts to the Geneva show, but it’s too early to talk pricing, production volumes, and timing. XG10 stands for X1, Geneva 2010. 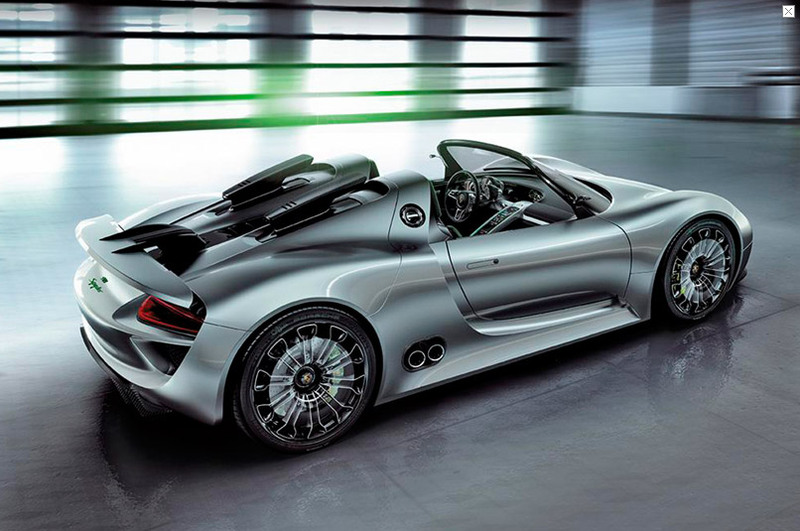 X1 is the code name of the 918 Spyder, which is only one version of many. Potential variations include a 918 coupe, an electric 918, and a 918 RS/RSR. This car can be either two- or four-wheel drive, have plug-in electric or gasoline power, come with an open top or a fixed roof, and be either a racer or a street machine. 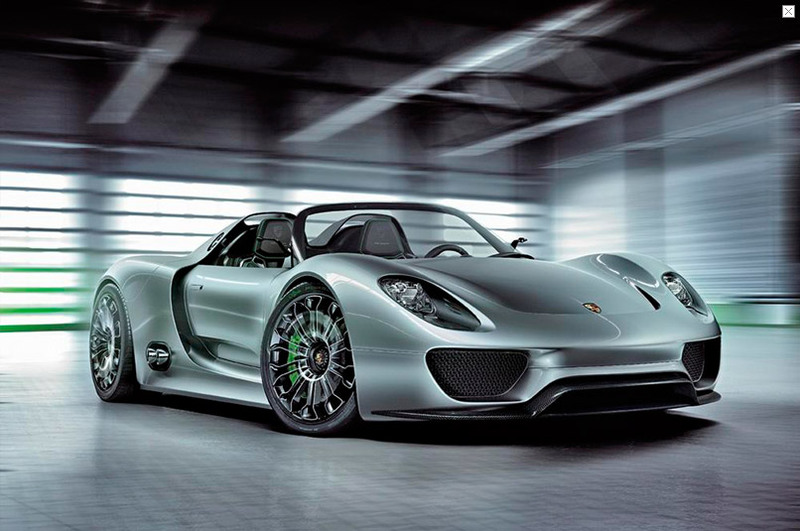 Its genetic evolution dates back to the 1997 Porsche GT1, which was a Le Mans–winning 911 on steroids. That car triggered project LMP 2000 (Porsche’s exciting Le Mans comeback car), which was halted at the eleventh hour by then-chairman Wendelin Wiedeking, who was always more of a numbers man than a car guy. 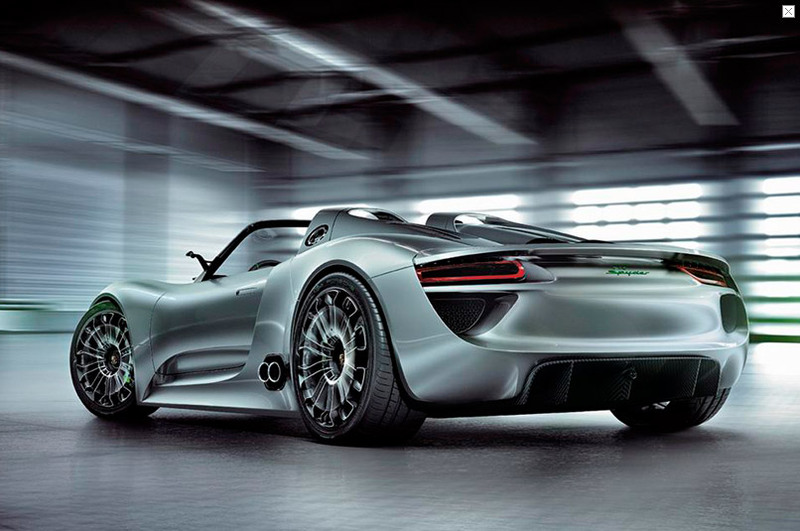 "This car shouts Porsche from every angle, and yet is truly advanced and not at all retro." 55 Mercury Monterey na Strip de Palm Springs, CA. Visto neste domingo de Páscoa na badalada "strip", parte da HWY 111 que atravessa o centro de Palm Springs, CA. Perfeito exemplo de um California Cruiser. Craftsmanship da maior qualidade. Fascination taken to a new level of intensity: The Audi R8 Spyder 5.2 FSI quattro combines breathtaking performance with the experience of open-top driving. 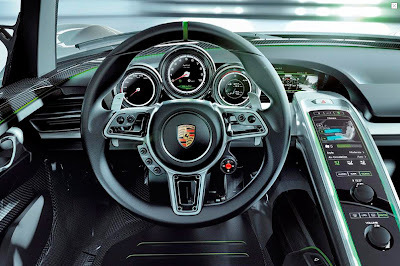 The 386 kW (525 hp) V10 engine accelerates the high-performance sports car with the lightweight cloth top to 100 km/h (62.14 mph) in 4.1 seconds on its way to a top speed of 313 km/h (194.49 mph). 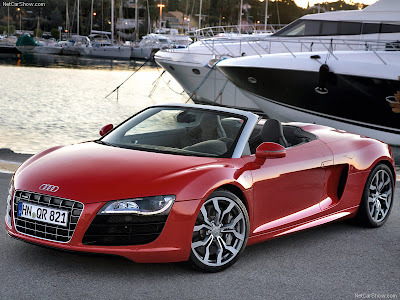 The Audi R8 Spyder 5.2 FSI quattro features a fascinating package of technologies, including the Audi Space Frame (ASF) made of aluminum and carbon fiber composite, quattro permanent all-wheel drive, LED headlights and the innovative seat belt microphone. Fascínio levado a um novo nível de intensidade: O Audi R8 Spyder 5.2 FSI Quattro combina performance de tirar o fôlego com a experiência de dirigir "open-top".O motor V10 de 525 cv acelera este esportivo de alta performance a 100 km/h (62.14 mph) em 4.1 segundos com a capota de pano leve, sendo que a velocidade máxima é de 313 km / h (194,49 mph). O Audi R8 Spyder 5.2 FSI Quattro possui um conjunto fascinante de tecnologias, incluindo o Audi Space Frame (ASF) feita de alumínio e fibra de carbono composto, tração integral permanente, faróis de LED e o inovativo microfone no cinto de segurança (??? ).